Mandarin Express is the "sister" restaurant of Canton Restaurant and Fortune Chinese Restaurant, with all three being operated by members of the same extended family. Canton is one of the oldest Chinese restaurants in Oklahoma City, and has set the pattern for the menu at all three restaurants, specializing in the most well known Chinese-American favorites such as chow mein, broccoli beef, sweet and sour pork, and egg rolls. All three restaurants are inexpensive, but I think Mandarin Express probably delivers the greatest quantity of food at the lowest price. 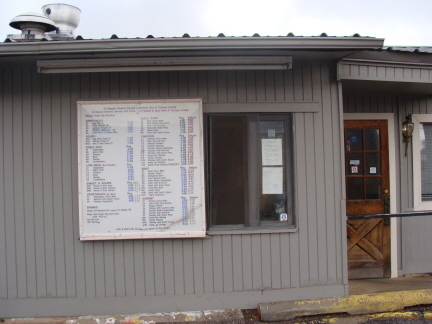 One characteristic of all three restaurants is that they do not have buffets, but rather have cheap enough prices that you can get more food for your money by ordering from the menu. I think this is much better because the food is always freshly cooked. 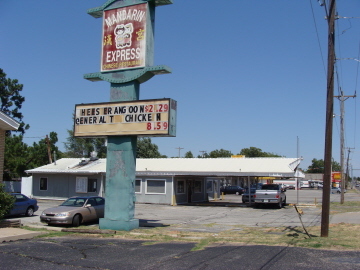 From the several times I have eaten at Mandarin Express, it seemed that more customers picked up their food at the take out window than ate in the restaurant. For those who eat in, though, the awning in front provides welcome shade in the summer. My knowledge of the food served from the menu at Mandarin Express is only from observation, though, since the dishes I tried have all been specially prepared non-menu items. I was able to do this by ordering the food a day in advance, and telling the owners I would eat whatever was available (I trust them to always prepare something good). I am not sure how much value this would be to other customers, since probably not very many people are as fanatical about authentic Cantonese food as I am so that they would want to order it ahead of time. I thought it was important, though, to let people know that this is not only possible at Mandarin Express, but the owners are quite gracious in trying to prepare special requests. The only constraint I found is that I could not go during "rush time" when the greatest number of customers were ordering lunch. I have not rated Mandarin Express because I have not ordered from the regular menu. I can say, though, that many of the special dishes I tried were better than the majority of the authentic "Chinese menu" items I have ordered in the Asian District around Classen Boulevard. I think there is great potential for customers to have much better than average Chinese food at Mandarin Express. Of the following items not listed on the menu, I think some would be fairly easy to prepare and could be ordered any time, and some would definitely require advanced notice. Some (especially the fresh Chinese vegetables) would be seasonal, and some would depend not only on the ingredients that were available, but also on whether the owners have had the opportunity to go to the Chinese market. The point of this writeup is not to recommend any particular dishes, but to give an idea of the variety found in traditional Cantonese cooking. Mandarin Express is one of the few places I have been able to find this type of food, and in fact is one of the better places I have eaten. The following photos are presented in the order in which I tried them. The first dish I tried, Pork and Bittermelon with Black Bean Sauce, was probably my favorite, despite the vegetable being exactly as it is described (bitter). 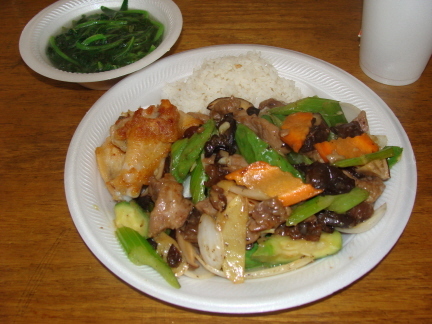 The bitterness of the vegetable is offset by the black bean sauce and the flavor of the meat (another green vegetable was also served on the side). I generally find that I cannot go wrong with dishes that are prepared with black bean sauce at the few Chinese restaurants in OKC that serve this type of sauce. I did not see black bean sauce on the menu, but I would expect that some of the regular dishes could be prepared with this sauce. Traditional Cantonese food usually starts with soup, and most Chinese soup takes at least a couple of hours to cook. This was true of the soup I tried with seaweed, green and yellow bittermelon, and pork. The soup was made from chicken stock, slow cooked with chicken bones (the bones are removed before serving) for flavor and nutrition. 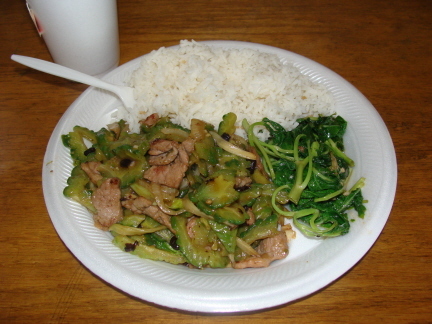 To me this had more of a bitter flavor than the bittermelon with black bean sauce, but it is a very typical Chinese dish. One of the points of traditional Chinese cooking is to alternate between flavors, meats, and vegetables, so that the food is not the same every day. 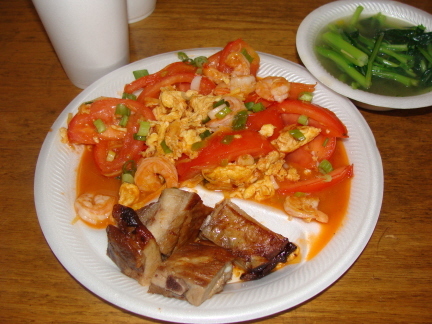 I have never discovered the Chinese name for Scrambled Eggs and Tomato, but this is a very common Chinese dish. The one served here was made with shrimp. It is not very evident from the photo, but Cantonese style eggs are usually made with a special sauce that gives them quite a distinct flavor from American style eggs. Pork Spare Ribs were served on the side, illustrating what I have found to be a Chinese custom of serving more than one item in a meal. The ribs are actually something I think would be available at the restaurant much of the time if you give them enough notice. The scrambled eggs take less time to prepare, and should also be one of the more readily available special items (but ask the restaurant to be sure). I'm sure the Yu Choi steamed vegetable was something that was seasonal. Wintermelon Soup is one of my favorite Chinese soups, and I was glad when they served it here. This was made with chicken stock, egg whites, chicken meat, and dried shrimp. 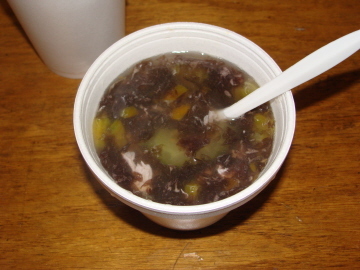 All chicken stock takes at least a couple of hours to prepare, so customers would have to ask if this type of soup would be available on a special order basis. 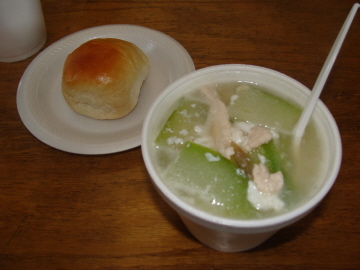 A home made sweet roll served with the soup was a type of dim sum that I only had once the several times I ate at Mandarin Express. I think they might be able to prepare similar types of food in larger quantities for special orders. The Cantonese style Chop Suey was the one dish I tried that I felt might be prepared in the same amount of time as the regular menu items at Mandarin Express. I was surprised to find that chop suey is not on the regular menu at the restaurant, although chow mein can be ordered. The authentic Cantonese style chop suey is different from the American style dish in several ways, some of which I am probably not aware. The sauce was very flavorful, and the vegetables included zucchini, mushrooms, and black fungus (wood ear). This one was made with beef, and I definitely think meat adds flavor to the dish. Traditional chop suey is a dish meant to be made with whatever ingredients are available, and I would think there would be a lot of flexibility in the way it could be prepared. I think the Chicken Wing served with it was the same as the ones served on the regular menu, and it was excellent. Based on chicken wings I have tried on Chinese buffets, I think this is a good example of why it is better to order food individually prepared instead of from a buffet. The dish pictured above is one that I think I got because the owners wanted to eat it for lunch that day, so they prepared an extra portion because they knew I was coming. 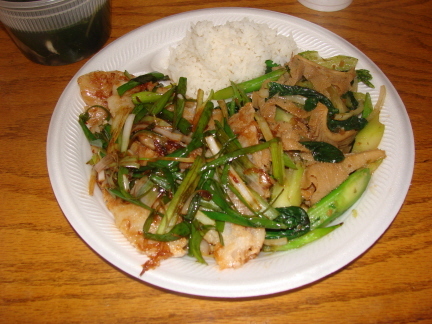 The left side was a Fish Fillet with Green Onions and Ginger, similar to fish I have ordered from several OKC restaurants. This one was not really much different from the others except that it came in a smaller portion that I could eat for lunch. The Beef Stomach is something I have seen on the "Chinese menu" at authentic restaurants, but I never had the curiosity to try it until it was served to me. It is not really such a strange food, since some Mexican restaurants serve equally unusal beef parts such as menudo. I liked Mandarin Express' dish better, though, than most of the menudo I have tried. The Gailan served with the meat is sometimes called Chinese broccoli, and is one of my favorite vegetables. I think, though, that it is seasonal. Mandarin Express is small, and I know they may not always be able to handle the preparation of some of the dishes shown here for a large number of customers when the current menu is based on stir fried dishes and food that does not take a long time to prepare. For long time customers, though, I would encourage trying new dishes or asking the owners if they have any suggestions for special dishes. For those who have not been to Mandarin Express, I would say the food I had was quite good, and has the potential to be the same for others. I enjoyed the chicken wings enough that I would not hesitate to order other items from the menu. In any case, it would be difficult not to feel at home in this cozy, family run restaurant.